Aslaug Magdalena Juliussen began her career in art by immersing herself in an ancient crafts medium. Born in 1953, she studied art in Oslo and afterwards wove wall hangings at the workshop of the textile artist Synnøve Anker Aurdal. There Aslaug Magdalena Juliussen arrived at reflections on tradition and on the natural environment in the context of art that would prove productive for her future work. Living in a Sámi family circle, the artist was soon working with traditional materials, translating reindeer hides and bones into abstract configurations: spheres covered in hides and pierced with antlers, wall hangings shot through with delicate bones and exquisite flowers formed of cloth, earmarks and glass. Juliussen succeeds brilliantly in weaving what might at first seem anachronistic-looking combinations of materials into powerfully expressive works of art to develop a distinctive aesthetic. As an artist she creates communication spaces between tradition and present, here and there, us and those perceived as other. 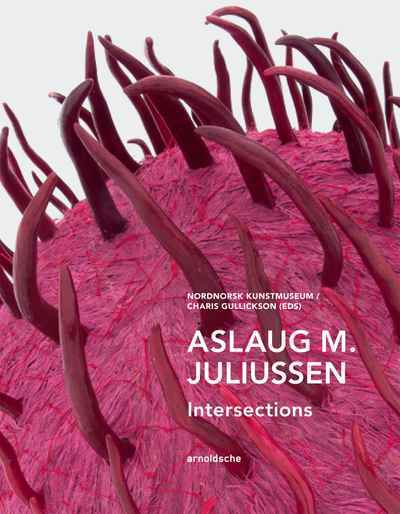 Apart from a lavish spread of illustrations, this publication includes brief interdisciplinary essays that shed light on Juliussen’s work from many angles — biology, philosophy, gender studies and art history — thus making possible an engrossingly profound dialogue on art in the context of a European indigenous culture.